The year ended on a high note with Casidra’s 25 Years of Excellence celebration and staff year-end function held on 28 November 2014, which was well organised, attended and characterised by a good atmosphere and spirit. It drew the curtain for Casidra on an eventful year filled with new developments, such as the appointment of its new CEO and the new Executive Authority. The night offered ample time to reminisce and reflect on the past 25 years and offered Casidra’s staff and guests the opportunity to relax and experience our hospitality. 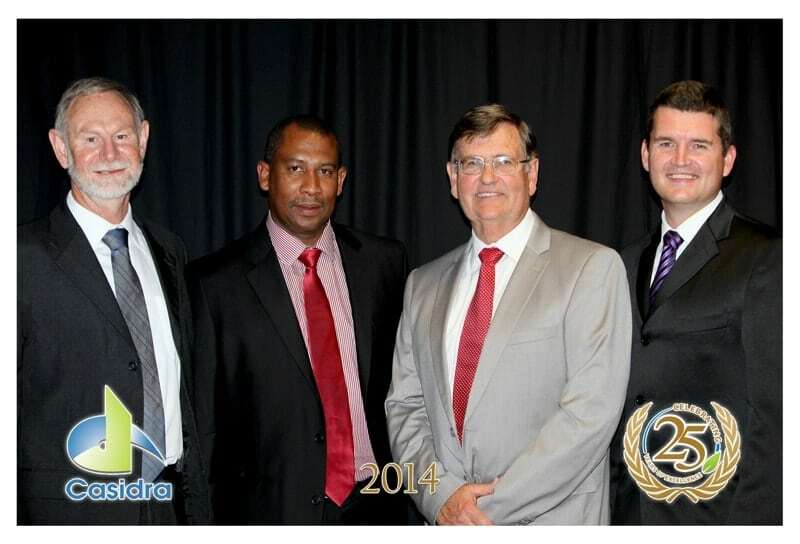 At the dawn of 2015, Casidra can look back on a year that was filled with various achievements, the most prominent of these being crowned the Western Cape Productivitysa regional winner (gold award) followed by the first runner-up award for the National Productivitysa in the Public Sector category. This accolade came as a big surprise to everyone at Casidra, especially since entering the event was not a planned action. Celebrating the achievement and the impact it had on staff morale cannot be downplayed. It also made us pause for a brief moment to congratulate ourselves on a job well done. Other achievements include the Emerging Seed Producer of 2014 Honour awarded to Waaikraal, and Liticha Fortuin from Amalienstein who won the Western Cape Female Entrepreneur of the Year 2014 Award, amongst other personal staff achievements. On an organisational level, Casidra was able to complete many of the initiatives endeavoured at the start of the year. These initiatives included the completion of Stony Point in Betty’s Bay, a long outstanding historical project that dragged on for many years due to technical challenges. A substantial number of the WCDoA’s Comprehensive Agricultural Support Programme’s projects were successfully completed. Furthermore, Casidra delivered about 200 rainwater tanks to various needy beneficiaries for a Rainwater Harvest Project on behalf of the Department of Water and Sanitation. Parallel to this, Casidra implemented a massive Alien Vegetation Clearing Project along the Berg River. Vast areas along the riverbank have already been cleared and indications look promising to complete the project before the onset of the 2015 winter. Our consciousness about the environment is found to be in the way in which we currently operate. The green initiative has become a standard feature in our internal meetings and engagements, our reporting to the Board, and has also become a prominent consideration at projects. We continually work hard on building sustainable relationships and to this effect maintain good relationships with the WCDoA, the ministerial office and other provincial departments such as the Provincial Department of Economic Development and Tourism, that is also growing in prominence. We understand how important partners are looking back at a successful year is proof of what can be accomplished. Crafting a view for the new year! Our plans this year are to continue building our brand that is defined by project management excellence, Casidra’s principal deliverable. We have revisited our annual Corporate Plan to set new targets for the year. The new goals and objectives have been revisited in our five-year Strategic Plan for 2015-2020. This is to ensure alignment with the Provincial Strategic Plan, enabling Casidra to meet the needs of our shareholder as well as the beneficiaries in the Province. With the achievements of 2014 still fresh in our minds, Casidra’s staff can positively look forward to 2015. If we manage to establish the past performances as our benchmark and strive to outperform that standard in 2015, we are set for success.